22 Dec 2000 consultant Singapore Got your postcard. I like your website. 19 Dec 2000 management consultant London I contacted your web page as a result of attending the Energy markets course at LBS last week. I did not find the information I was looking for (probably I am looking in the wrong place). However, I think that you have an excellent site. 14 Dec 2000 publisher Washington, DC This is quite a site! 6 Nov 2000 manager San Francisco I really enjoyed listening to this!! I could listen repeatedly for hours. It's wonderful that you are so creative and actually act on those impulses! 16 Oct 2000 - Indonesia ...about Autumn Shivers. I think the harmony is the richest among your other composition. It reminds me to Debussy's music. Very nice web site Anne. Very tasty with no clutter. I reached this through your color chart then started surfing your opinions. I like. Do you hand code or are you using an HTML editor? Both. I use an editor and then hand code. Please excuse the mix up. I'm not sure how I managed it, but I obviously confused my search. Having been in the first Kadena class and knowing you at Kubasaki, I have found more than one instance where I mentally switch schools. Nonetheless, I have enjoyed your site, the music, writings and thoughts, make up the most well balanced and interesting places I've visited on the web. I hope you're able to attend the 80's reunion next year. 22 Sept 2000 - Singapore Just want you to know that I enjoy surfing your website. Whenever I lunched in (like what I'm doing now), I will "tune in" to your site to read your diary, etc. for some entertainment. Well, I think this is really a good way to keep in touch with your friends! 22 Sept 2000 - - I don't know if this will get to Ms Ku, but I have to write it anyway this probably makes me a child, but I fell in love with the flute melody from the titanic theme My Heart Will Go On, and have been trying to find a flute composition for almost a year now...without luck, so thank you very much, you've made me a very happy guy! oh, and it's alot easier than I imagined it would be isn't it? 24 July 2000 - Kuala Lumpur, Malaysia Excellent, excellent I must say. I'm usually very lazy to drop by guest books to leave my mark. This is my very FIRST doing so. I feel compelled to do so because your compositions and arrangements had truly impressed me. Again, I like your site very much. 21 July 2000 assistant principal Georgia, USA The redesign looks fabulous. It is a little daunting at first glance though but overall quite an achievement. I loved your site! It is an incredible effort to put out there for all to see. I was particularly impressed with the collections of photos and the writings. Your diary is interesting. There are things I see now that I remember about you from Kubasaki. You were far ahead of some of the rest of us at that time. 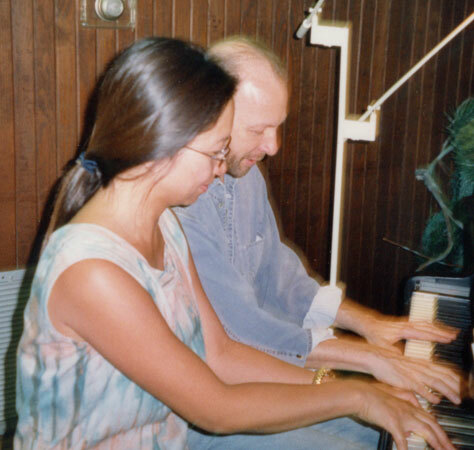 17 July 2000 composer, pianist Houston, Texas It was great meeting you today at my studio in Houston. I enjoyed playing the piano duets with you, sharing each others compositions and talking about amateur musicians, corporate creative responsibility, life decisions, and other subjects. I look forward to cultivating a friendship. I think there exist strong mutual interests which should lead us in that directions. I liked going through your site. It's has so many facets. I hope to discover more about you by reading its contents in more depth. 16 July 2000 teacher (American Literature, composition) St Louis, Missouri I like what you have already covered. Glad your classmate passed on the site to my wife (also a classmate) so I got to take a peak! 30 June 2000 - Australia I found your articles on Power Pooling very informative. I believe that these were compiled in 1997 and am keen to know if you have updated the information and also how I could look for additional information on this matter (i.e. a comparison of power pools etc..) I am currently looking at the deregulation of the power industry in South East Asia and thus my interest in power pooling and other related topics. 29 June 2000 student UK I have read your comprehensive article about the laws about the immigration matter. I have to say that it is very good and very useful. Thank you!!! It is very hard and takes lot's of time otherwise to find good information about this matter. 29 June 2000 decision scientist USA Sure are a lot of guest book entries. Will I have to get in line when you become an Internet celebrity?! Maybe you should make your own product and be the competent manager of that!!! 27 June 2000 classmate USA I just wanted to let you know that I saw the photos. Great job on the web site, you're a stud! I was digging through some old KHS things that I haven't seen in years. I'm going to try to get them scanned soon I hope, and send you the results. I hope they are of things that you haven't seen before, or at least not in a long time. 23 June 2000 father of 5 in musical family Geneva Can't display the PDF file... Which font are you using to create the document? A good idea would be to make the corresponding .ttf file available on your site! I like what you do! 22 June 2000 bachelor Washington State You looked fantastic by the way. Anybody would guess you to be in your younger 20's, so keep up the good work! 22 June 2000 9th grade student Toronto Do u have any piece available for Men? I think that it is good to have a home page like this. 18 June 2000 civil engineer London I love your web site. 17 June 2000 retired translator and lecturer Taiwan I also read all your notes on when and where and why you composed these works. You should have majored in music! I think some day, you'll have a publisher or firm to have all your compositions produced in compact disk and your scores published in album form. 16 June 2000 - India Hi, I learned about AnalyticalQ from the footer of Anne's review of Striking It Rich in Freepint. I would like to submit a book review for your consideration. It's about 'Exegeis', a recent novel written in the e-mail mode. How do I submit it to you and where? 6 June 2000 contract researcher, musician, etc NW USA I got to this site while searching for a discussion of algorithms used in load balancing and optimization of capacity on electrical power transmission grids, which is related to a commercial research project I am involved in. Much to my surprise, I also found relevant links to personality tests, and to music, which are each core areas of personal interest - so I found a major intersection of interests. 6 June 2000 - New Jersey I was so impressed by your site. It is an amazing resource of wisdom gained by travel and unique experiences. Your thoughts are as deep as they are diverse. A true inspiration! 4 June 2000 academic turned analyst Texas Instead of diary of anne frank. Would "tales of the city" be more appropriate? 3 June 2000 rocket scientist UK I think your site is a great means of self-expression. If you're getting that many hits, you must be able to convert your web designing talents to some fairly lucrative ends! I guess that's not the only reason you do it, though. 16 May 2000 clergyman Florida Your website is extensive and impressive. What kind of response have you had? It was odd to listen to your music. Amazing how we can send it now via the Internet. 11 May 2000 homemaker California What a privilege to have attended high school with Anne... and to remember the quiet beauty she extended to all of us. It is even a greater privilege to see she has continued to embrace her talent... extending the beauty to many once more. 10 May 2000 accountant Manchester I like the idea. I noticed your site in Freepint and browsed through your sire looking for ideas to emulate on websites which I am setting up for voluntary bodies, principally http://i.am/taracce at present. Keep up the good work. 10 May 2000 civil engineer Hawaii Very interesting site!!! Great work, especially in the ease of download of photos. When I tried your "Pandora's Box" link, I realized that it is restricted, but once into the authentication process, could not get out by canceling, etc. so I had to use a book mark to get out, then reenter through the KHS Alumni BB link. 9 May jazz pianist Japan I'm thrilled that you're beginning a journal. There's no one I can think of who might have more variety to write. 9 May 2000 software writer southern California I found the link to AnalyticalQ on the KHS alumni website and was overwhelmed to find what it led me to. I found myself returning to it a few times to read more about what it is all about. Sounds like you are having quite a life! I'm impressed. 4 May 2000 academic SW-USA It's a wonderful site to browse. Lots of interesting things. Add some advice on wines, which should go well with the music. Maybe it's already here. 3 May 2000 pianist - I listened to all the music that I could get to and enjoyed all of it. Oh, and I should tell you that my youngest daughter is just in love with your arrangement of Titanic. (I'm delighted with anything that will encourage her to practise violin more). 2 May 2000 graphic designer California Your main title area is sort of big, but it's much better than forcing your viewer to load giant cheesy graphics in its place. (Although I keep looking at the 'Q' expecting your smiling face to pop through it.:). Anyway, I hope that helps. There's so much cool stuff on your site! 26 April 2000 carer mid west USA Just visited your website. It is very nice. Just a bit overwhelming at first. I do like the fact that you have not forgotten about the people who still browse with modems and phone lines. I always hated really flashy-for-no-reason websites. Probably a holdover from the old days of Archie, Gopher, Veronica, and Lynx. If you have nothing to say, a picture is worth a thousand words of nothing to say :). Your pages have inspired me to start mapping out my own. 20 Apr 2000 music teacher Norway Have you had this beautiful site for a year without telling anybody? I listened through a few of the midis. Really well done! I especially liked the harp solo. 19 Apr 2000 criminal lawyer Southwest USA I had fun browsing through your web site . How fun! I really like the musical part. And the portraits of a lady. 17 Apr 2000 pianist USA I found your site looking for free sheet music and thought the song (Ides of March) sounded neat. 7 Apr 2000 guitarist UK I like your site. I need some time to explore it properly because it's so big!! 5 Apr 2000 scientist Finland I was much impressed by your website, congratulations. 28 Mar 2000 lecturer Honolulu Continue to provide beautiful music. I really like your music which was very soothing and relaxing. 11 Mar 2000 MBA student Chicago I was researching on Real Options for a paper that me, together with my team members, were preparing for an E-commerce class. And I stumbled on your site - and got distracted from the assignment on hand! In any case, was extremely intrigued by your site. - it touches on many areas; from music, to electricity capacity planning, from poems to psychology. 11 Mar 2000 Soldier of Fortune East Coast, USA Great ideas, a knack for creative thinking, and a talent in decision analysis. You seem quite talented...as does your sister. Is her name Francine or Frances? 24 Feb 2000 journalist UK I read in Freepint that you have researched weather sites on the Internet. I am writing an article about features - calculators etc - that can add value to Web sites. 11 Feb 2000 sales & marketing Shanghai Anne, you never fail to surprise me! 11 Feb 2000 music professor / composer Nashville I enjoyed reading through "St. Valentine." It shows your appreciation for the pleasures of starting with a simple rhythm and then building up to a more dense rhythmic texture. 8 Jan 2000 lecturer Maryland . . . download your thesis, which provided me lots of help when writing the proposal. I also noticed the content of your new book (to be written or is done?) . . .